Cheerful visitors pose in front of the LOVE statue soon after it’s installation in John F. Kennedy Plaza for the bicentennial in 1976. 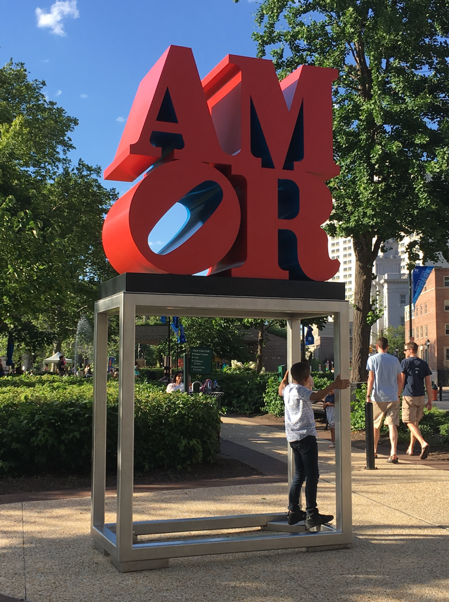 Although there are many LOVE sculptures, Philadelphians consider the one located in the plaza to be the most significant. The plaza sculpture is the only one elevated on a seven-foot mount, and since its instillation it has become one of the biggest attractions for tourists, particularly for engagements and weddings. 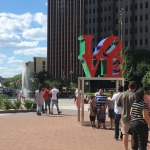 The statue served as the catalyst for renaming the plaza “Love Park” in 2016. 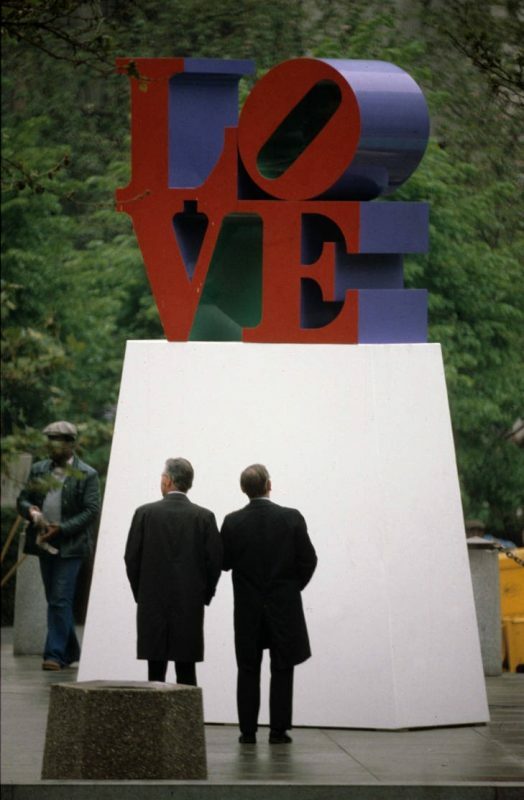 By 1978, the LOVE sculpture had become a cherished Philadelphia attraction. A planned sale of the statue to a New York buyer sparked a public outcry, prompting the chairman of the Philadelphia Art Commission Eugene “Fitz” Dixon (1923–2006) to buy the piece on behalf of the city for a whopping $35,000. This 1978 photograph captures the day the beloved sculpture was permanently remounted in its Philadelphia home. It has since become an emblem of the what the city stands for: brotherly love. Robert Indiana, pictured here working in his studio, was born Robert Clark (1928–2018), and was one of the founders of the Pop Art movement. After attending a technical high school, he spent three years in the U.S. Air Force. He then shifted his professional interest to art and studied at the Art Institute of Chicago (1949–53), the Skowhegan School of Sculpture and Painting (1953), and the Edinburgh College of Art in Scotland (1953–54). In 1954, Indiana moved to New York and later showed at the Stable Gallery in 1962, where Andy Warhol (1928–87) and Cy Twombly (1928–2011) also held their first exhibitions. While recognized as a leader in the Pop Art community, Indiana differentiated himself from his peers by addressing social and political problems. 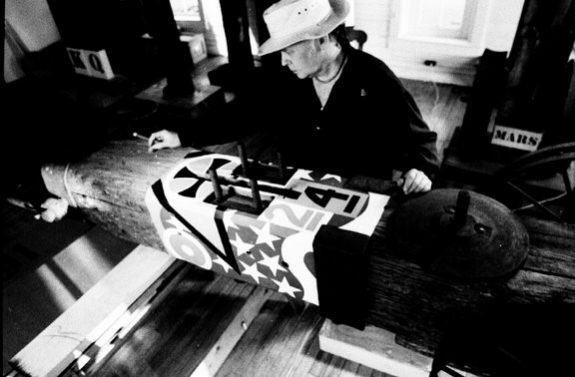 Early in his career, Indiana created wood sculptures with painted words on them, such as Moon (1960), a rough vertical plank of wood with attached wheels and a trail of moons leading to the lettering at the top. 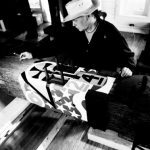 Indiana declared that with this piece he was attempting to make “the Unloved into the Loved.” Throughout his career, Indiana focused on American themes and issues, often reproducing letters and symbols from diners and road signs that caught his eye. 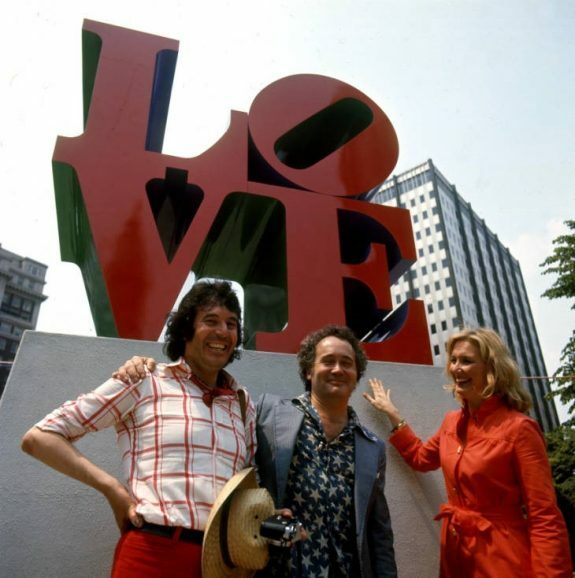 The beloved Philadelphia LOVE Sculpture (1976) is Indiana’s most famous work. The LOVE design of four letters stacked in a square with a tilted “O” predated the Bicentennial, as did the artist’s association with Philadelphia. Indiana (who took the name of his home state) worked in New York, but his first single-artist museum exhibition occurred in Philadelphia in 1968 at the Institute of Contemporary Art (ICA) at the University of Pennsylvania. On the rise as a Pop artist, Indiana was working in a style he termed “verbal-visual,” in which words became elements of art. LOVE, which appeared at ICA in the form of paintings, prints, and a small sculpture, had been developing as a motif in Indiana’s art since 1961, when he created the design for a personal Christmas card and then for an immensely popular set of holiday cards issued by New York’s Museum of Modern Art. A subsequent LOVE poster for an Indiana show at New York’s Stable Gallery in 1966 further disseminated the design, which struck a responsive chord in the emerging counterculture of the 1960s. Along with love-ins, love beads, and other symbols of love and peace, Indiana’s work seemed symbolic of the times. In addition to LOVE, the body of Indiana’s work displayed by ICA in 1968 included many other paintings, sculpture, and prints with themes drawing primarily upon American literature, current events, history, and popular culture. ICA director Stephen S. Prokopoff (1929-2001), one of the exhibition’s curators, viewed Indiana’s focus on American themes as harmonizing with Philadelphia’s history as a center for American art in the early nineteenth century. The catalog for the ICA exhibition contributed to later scholarship about Indiana’s work by including the artist’s “auto-chronology” of his life and work to that point in time. By the early 1970s, LOVE came to overshadow Indiana’s other work as it circulated in many forms, as original art and in copies both authorized and unauthorized. The artist had come to the opening of the ICA exhibit sporting an 18-carat gold LOVE ring, one of series of 100 he had authorized to be made by Villanova-based Rare Rings, a new venture by Pop-art merchandise entrepreneurs Joan Kron and Audrey Sabol. For the cover of the novel Love Story (1970), another artist closely mimicked the colors and typography of Indiana’s design. Indiana himself produced versions large and small. A 12-foot-tall steel sculpture of LOVE, which became part of the permanent collection of the Indianapolis Museum of Art, traveled for exhibition in Boston and New York in 1971 and 1972. A 20-foot painting of LOVE appeared in an Indiana exhibition in New York. Indiana also created a miniature version of LOVE for a postage stamp, issued in time for Valentine’s Day 1973. Philadelphia, as the City of Brotherly Love, provided the setting for a first-day-of-issue ceremony held at the Philadelphia Museum of Art. The U.S. Postal Service went on to sell more than 300 million of the eight-cent LOVE stamps. Intended to be red, green, and blue, the stamps turned out to be red, green, and purple—the result of overprinting blue over red. The aluminum LOVE sculpture placed in John F. Kennedy Plaza, the public park at Fifteenth and JFK Boulevard near City Hall, featured the same colors as the stamp—red, green, and purple (replaced by blue during subsequent restorations but returned to the original purple in 2018). Indiana loaned the work to Philadelphia for the Bicentennial, a year also marked by the installation of Clothespin by another leading Pop artist, Claes Oldenburg (b. 1929), one block away at Fifteenth and Market Streets. LOVE, alas, proved to be fleeting. When the artist’s dealer recalled the sculpture to New York for a potential buyer in 1978, a public outcry ensued. 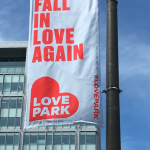 City officials, who admitted to having no knowledge of the art market, had declined to pay the $45,000 asking price to keep LOVE in the park. Ultimately the price came down to $35,000, paid as a donation by Fitz Eugene Dixon Jr. (1923-2006), owner of the Philadelphia 76ers basketball team and chairman of the Philadelphia Art Commission. The Quaker Export Packaging Company donated its labor to retrieve the lost LOVE. Secured again in John F. Kennedy Plaza, LOVE became a landmark and reference point in local geography. The Philadelphia Inquirer attributed the usage “Love Park” to homeless people who frequented the plaza during the 1980s. 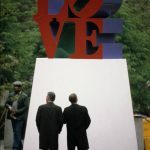 During the 1990s, “Love Park” gained widespread currency among skateboarders attracted by the varied levels of stone and concrete walls, steps, and benches of the plaza. Skateboarding videos and video games spread the image of LOVE in Philadelphia. 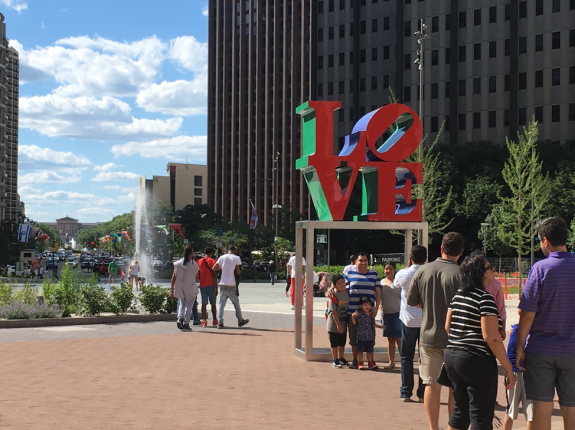 By the time a thorough redesign and reconstruction of the plaza occurred in 2016-18, plans prioritized keeping LOVE in its place and termed the surrounding public space as JFK Plaza/Love Park. 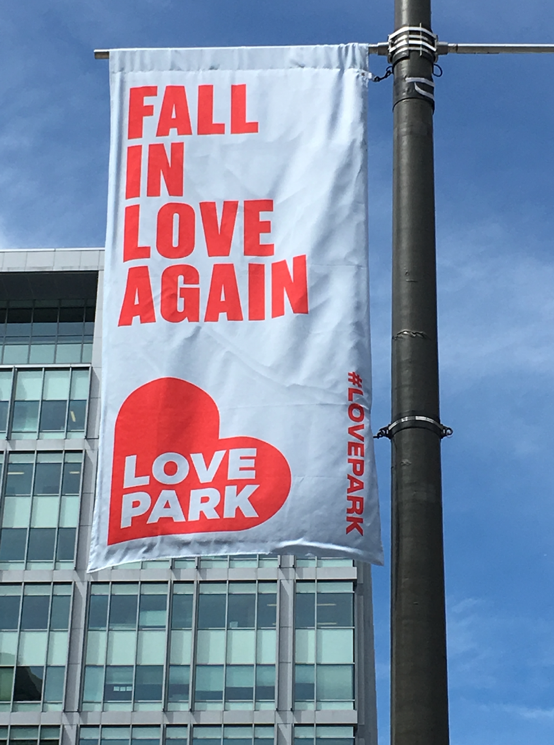 When the park reopened, “Love Park” appeared on banners and signs as a promotional brand. Indiana continued to create LOVE sculptures into the late 1990s, including variations in other languages. By the twenty-first century, they could be found across the United States, in Israel, Europe, and Asia. In the Philadelphia region, the University of Pennsylvania and Lehigh University each had its own LOVE, and Ursinus College had a copy authorized by the artist. In 2015 for the visit of Pope Francis (b. 1936), the Philadelphia Museum of Art brought one of Indiana’s Spanish-language AMOR sculptures to the city, where it remained. Philadelphia did not possess LOVE alone. 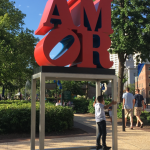 Nevertheless, the sculpture became one of the city’s most recognizable icons, attested and reinforced by the steady flow of visitors seeking it out, posing for photographs, and placing themselves into a distinctively Philadelphia scene of LOVE. Charlene Mires is Professor of History at Rutgers-Camden and Editor-in-Chief of The Encyclopedia of Greater Philadelphia. Bach, Penny Balkin. “Love Sculpture Symbolizes ‘What We Hope for, Cherish, and Memorialize.’” Philadelphia Inquirer, May 22, 2018. Conheim, Maryanne. “How LOVE Was Won.” Philadelphia Inquirer, April 30, 1978. Haskell, Barbara. Robert Indiana: Beyond Love. New York: Whitney Museum of American Art, 2013. Robert Indiana. Introduction by John W. McCoubrey. Philadelphia: Institute of Contemporary Art, 1968. Ryan, Susan Elizabeth. Robert Indiana: Figures of Speech. New Haven: Yale University Press, 2000. Simpson, Fiona W., ed. Love and the American Dream. Portland, Maine: Portland Museum of Art, 1997. 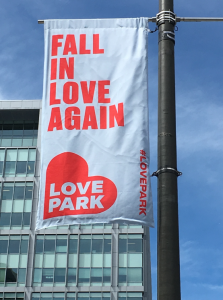 LOVE, in Love Park, Fifteenth Street and JFK Boulevard, Philadelphia. 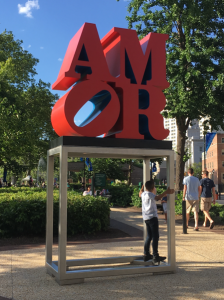 AMOR, Sister Cities Park, Eighteenth Street and Benjamin Franklin Parkway, Philadelphia. 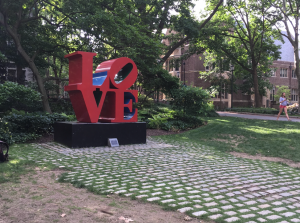 LOVE, Locust Walk near Thirty-Sixth Street, University of Pennsylvania Campus, Philadelphia. 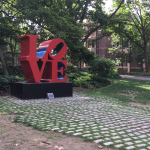 LOVE (after Robert Indiana), near Wismer Center, Ursinus College Campus, Collegeville, Pa.
LOVE, 38 Asa Drive, Asa Packer Campus of Lehigh University, Bethlehem, Pa. Thanks for sharing the love, Charlene! In the 1970s, largely because of the symbolism of Indiana’s LOVE sculpture, the park became a site for anti-war, gay rights and more recently trans rights protests. I still remember 92 year old Ed Bacon wobbling in front of that sculpture on a skateboard in 2002 to protest City Council’s ban against skateboarders. Love is love is love.